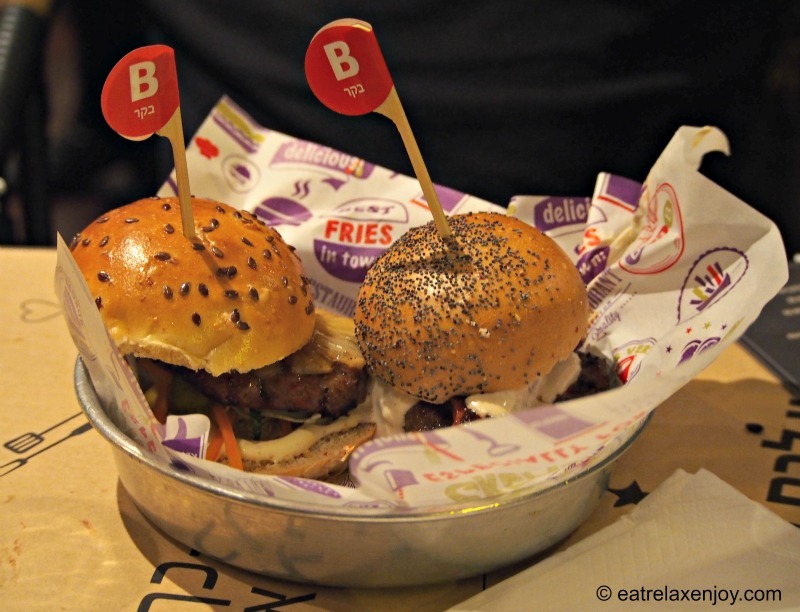 Burgus Burger Bar (BBB) is a well established Israeli diner chain that specializes in quality burgers and much more. BBB announces a new menu with a collection of concept burgers such as Latino, Maragez, Jamaica, and more. All BBB’s burgers are made from selected parts that are made fresh and grinded locally. 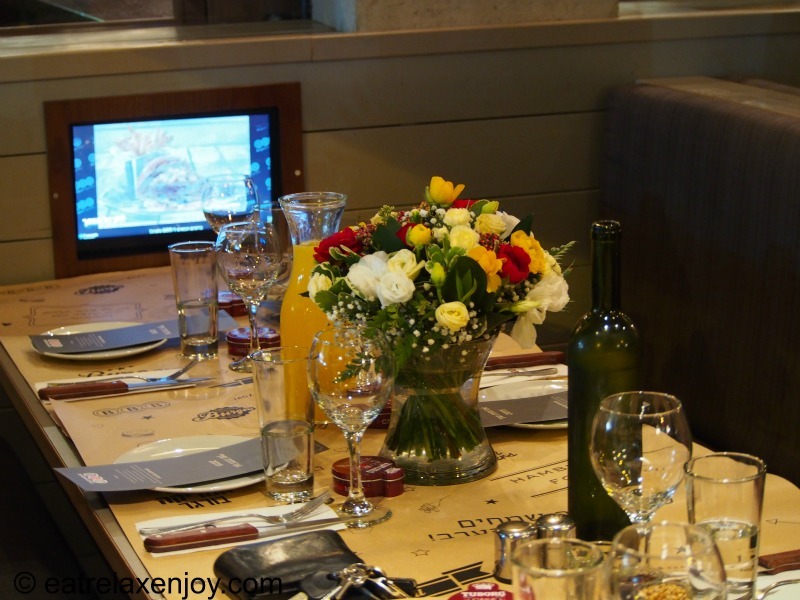 This Israeli diner is decorated like an american diner, with booths, which are equipped with touch screens that show the menu as well as enable games, including such that are from one table to another. 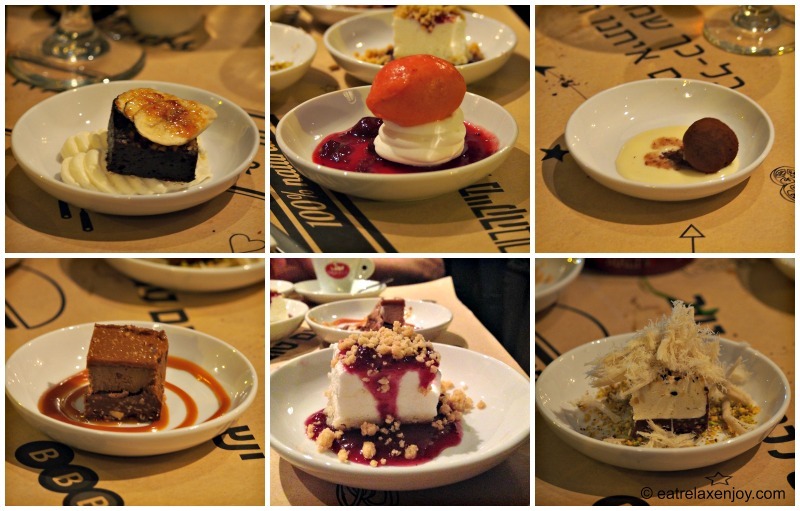 We ate a ‘tasting’ meal presenting small portions of sample dishes from the new menu for 2016. Note, the full sized courses are bigger. 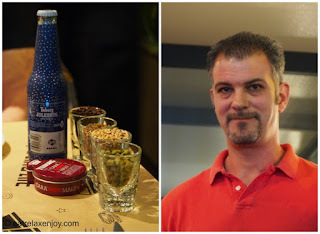 Each course was accompanied with the beer that best pairs with it, we also got explanations about the food and the beers and how to select the right beer for each type of food. Wings without bone with chilly soy and sesame – a surprising dish! There is no need to dirty hands to take apart the meat from the bone, and it is less greasy. The sauce is a bit sweet and spicy. Roast beef on arugula with reduced balsamic sauce and garlic confit – excellent , exactly made, red and soft emphasizing the quality of the meat served. Popcorn fish – salmon filet in rice crispy crunch shell with teriyaki and chilly – I loved this dish, very crunchy and the sauce has a lot of chilly (a bit spicy). Chicken liver pate with (dairy) onion confit – very well done, somewhat sweet. 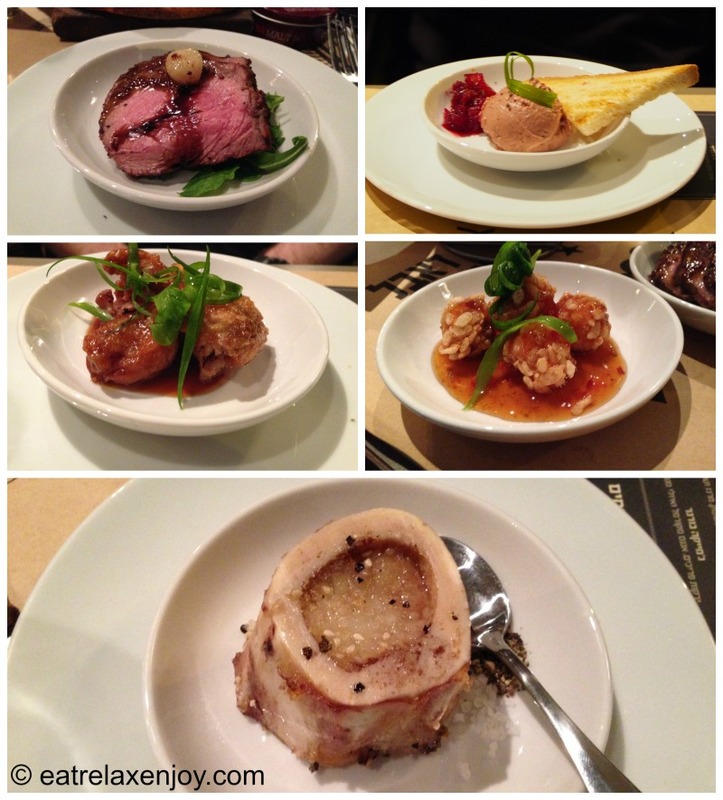 Roast bone marrow served with Jewish salt and pepper – not my cup of tea. The starters were served with two beers – Carlsberg and Tuborg. Carlsberg is bitter and sharp and is well-suited to accompany the Bone Marrow and to salad. Tuborg pairs well with the rest of the starters. There are also salads and vegan dishes. Butchers Burger with Foie Gras – smoked goose breast, arugula, crispy onion, pickle, onion confit and foie gras. Margez Burger – arisa, salsa picante, onion in Sicilian suma, Maragez sausage and tahini sauce. We started with the Latino Burger (right hand side) and the Butchers Burger with Foie Gras. We had the burgers with Weihenstephan beer. The Latino Burger was a wonderful surprise. The burger is served on a soft beet bun that has a gentle pleasant taste. While I’m not a big fan of Mexican food, the combination of the not-so-spicy guacamole with the crispiness of the onion and the rest of the toppings of this burger makes it a superb dish! The combination of the Butchers burger with the foie gras and the smoked goose breast make it the perfect burger to the core meat lovers! The mix of meats is to die for! It is worth mentioning that the buns of these burgers are not plain burger buns. Similarly to the Latino, these burgers are served on fresh boutique buns. 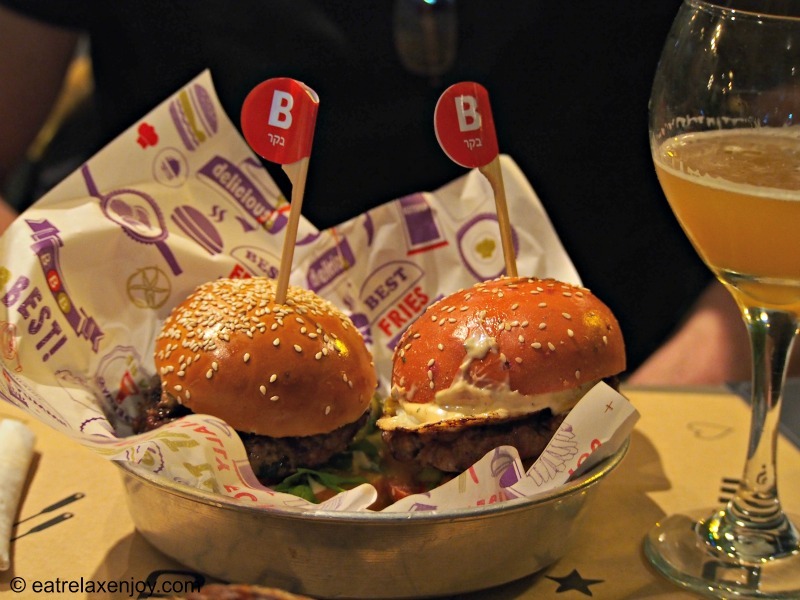 No doubt that this upgrades these superb burgers! Maragez Burger was served with Leffe Bruin beer. The sausage is spicy and the burger was one of the favorites of my partner. The Jamaica Burger was served with Leffe Blond beer (this beer pairs well with sweet flavored food). This burger is quite sweet and the crispiness of the vegetables is emphasized. The desserts were excellent, including the vegan one. If you order the Cookie butter and chocolate cream, let it sit a soften, it turns into a delicacy when soft! 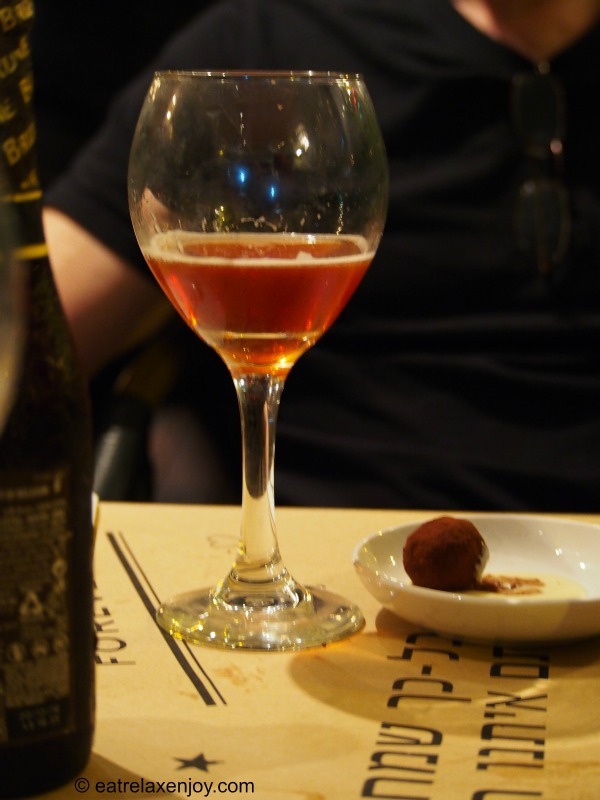 The desserts were served with Leffe Ruby. This beer contains raspberry, blueberry and strawberry. While some argue that it is not a real beer, it is quite a ladies’ favorite here. It pairs well with the desserts because of its sweetness.